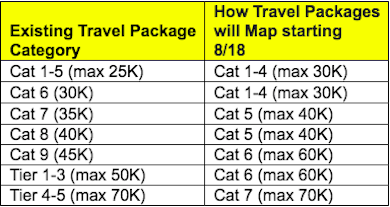 Marriott has finally revealed how Travel Packages will convert (this is something I’ve discussed endlessly here, and I finally pulled the trigger on two packages yesterday). When it comes to converting, you can only book a particular category of hotel between now and the end of the year, and that category is indicated based on the first thing listed in the right column. Then next year when they add peak and off-peak pricing, your certificate will be worth a certain points amount. Marriott is actually being extremely unreasonable here. On the most basic level, if you booked a Tier 3-5 certificate (the most expensive certificate possible) it won’t even be redeemable at Marriott’s most expensive properties come next year, when Category 8 hotels are introduced? How is that justifiable? At a minimum the most expensive certificate should be redeemable at the most expensive hotel going forward, no? And then to map both Category 9 and Tier 1-3 certificates to Category 6 is unreasonable. To be clear, Marriott Travel Packages were extremely generous, but that doesn’t mean we should settle for unreasonable mapping. What’s odd here is that those of us with Category 9 or Tier 1-3 certificates might actually be better off waiting until next year to book. This year the certificate would be valid at a Category 6 property, while next year it would be redeemable at up to a Category 7 property in either off-peak or standard (but not peak) season. That’s because Category 8, as well as peak and off-peak pricing, is only being introduced next year. The further big issue is the expectations that Marriott has created here. By intentionally not publishing the chart in advance (and clearly it was intentional, because they published it the day the new program went into effect), this led people to the logical conclusion that they were planning on being generous. Marriott has a lot of unhappy people right now, and if their plan was to convert the certificates in this way, why didn’t they just tell us the mapping in advance? You’d think they’d want to launch the new program with happy members, but this doesn’t do a whole lot to create that. I’m curious, for those with outstanding certificates for Travel Packages, are you happy about the conversion rate? I’d be surprised if many people are happy… which really makes you wonder what Marriott is hoping to accomplish here, especially with the lack of communication on this prior to today.